Awful conditions for this Sunday open. Drawing rain and heavy winds made for difficult presentation on the Match, Specimen and Arena Lakes for the 42 anglers fishing. Winner today was Ian Wood (Larford) who drew peg 48 on the Match Lake. Ian caught on paste down his edges weighing in 254-08-00. 2nd on the day was Ray Lamb (Larford) who drew peg 46 on the Match Lake. Ray caught short and down his edge with pellets and corn weighing 233-08-00. Andy caught on 6mm pellet at 13m weighing in 145-01-00. 4th on the day was Jamie Harrison (Matrix) from peg 64 on the Match Lake. Jamie caught everything on the feeder short & down his edge weighing in 137-00-00. 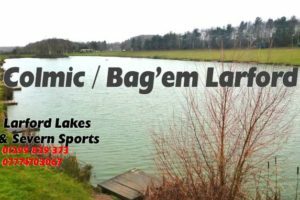 5th placed Neil Colcombe (Larford) drew peg 72 on the Specimen Lake. Neil caught on the Long pole pinging pellets to weigh 130-06-00. 6th placed Steve Rocke (Larford) drew peg 62 on the Match Lake and fished short pole and down the edge with 8mm pellet landing 129-04-00.